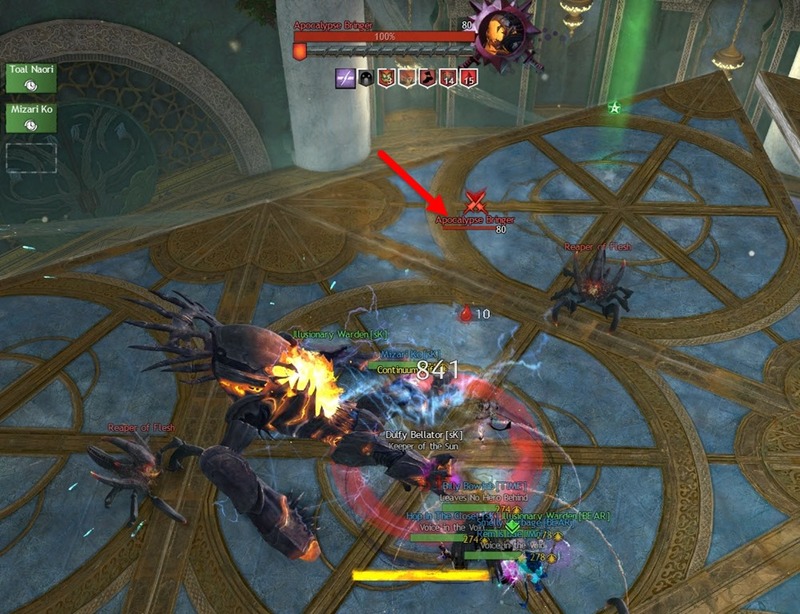 GW2 Qadim Mythwright Gambit Raid Guide. Qadim is a mechanics heavy end boss for the Mythwright Gambit raid wing. There are a bunch of mechanics and role specific assignments to learn but once you get an idea of them of all it is a fairly straight forward fight. 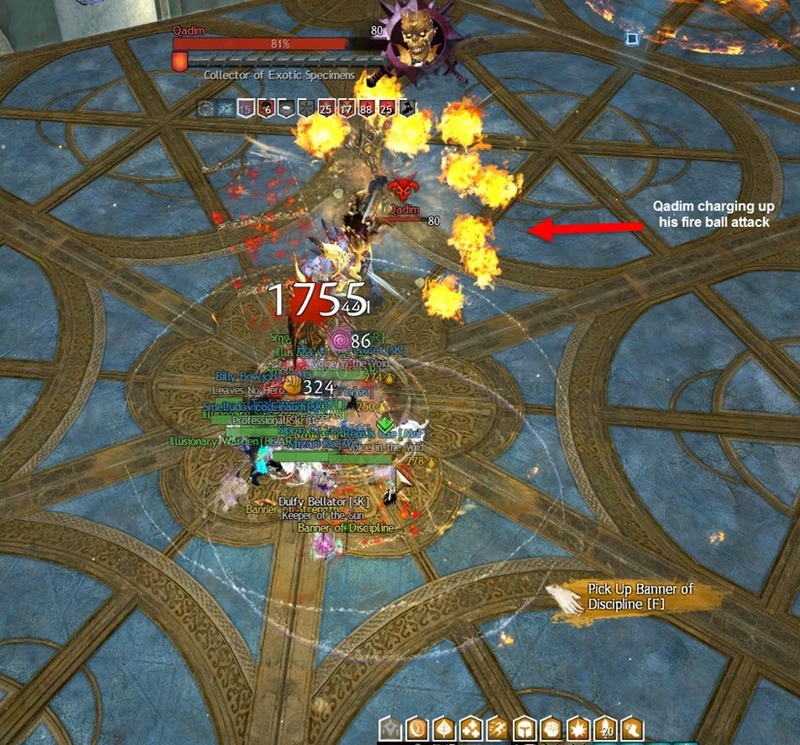 Power DPS is preferred here due to short burst fights. 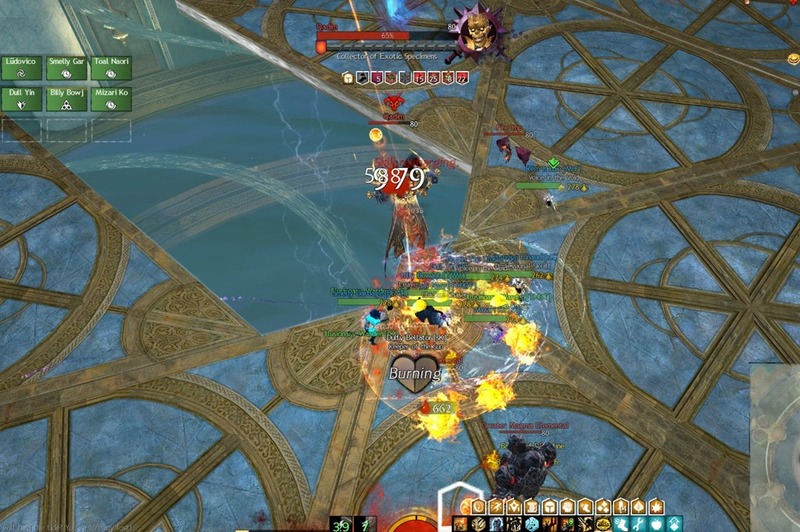 Chronomancers make great tank here and also good power DPS for doing lamps & elementals due to their ability to pull trash mobs together for easier cleaving or removing the CC bar from the Magma elementals. 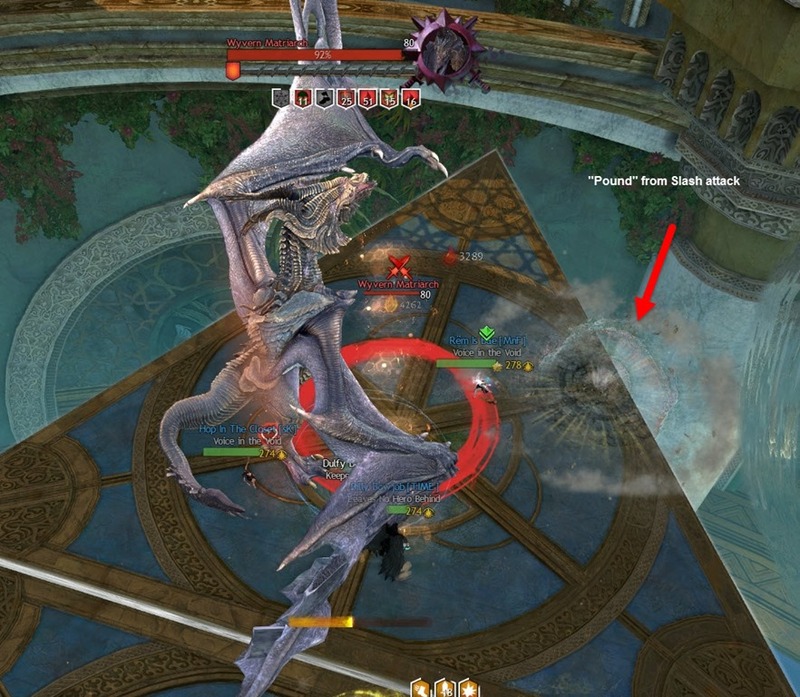 Aggro here is based on proximity so the tank need to be inside the hitbox to gain aggro. 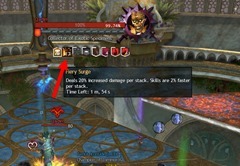 Lamp team: Two players can do this job easily ( a power DPS and a power chrono for example) but for the third lamp it might be safe to have a third player for additional safety. Legendary Boss team: Rest of the raid will be on this team. 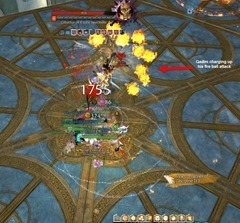 It requires quick CC and a chrono tank & healer. 1 DPS per Pyre Guardian, needs boon strip for two of the Pyres. Qadim starts at the far left triangular platform invulnerable. He will start spawning Lava Elementals one at the time at the three corners of the triangular platform he is standing on. 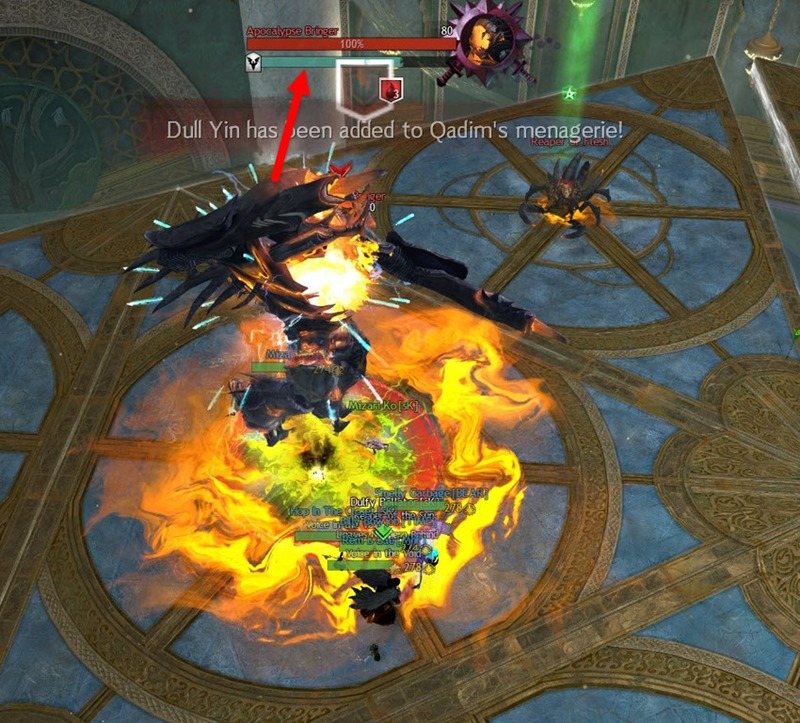 The elementals will slowly move towards Qadim and if they get into his hitbox, Qadim will absorb them, gaining a stacking buff called Fiery Surge for 2 minutes that give him 20% more damage and 2% faster skills per stack. 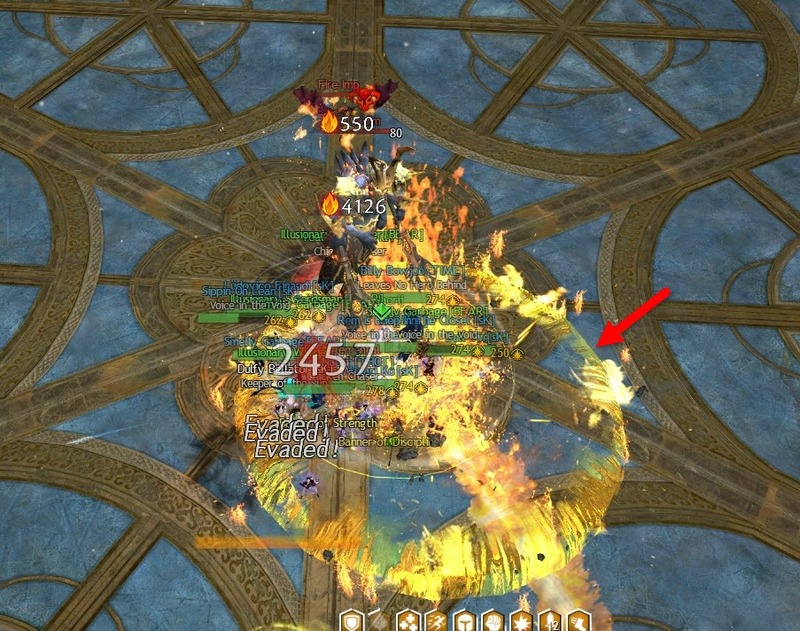 Your job as the Elemental Kiter is to run around the platform around Qadim, avoid his attacks and kill the Lava Elementals as soon as they spawn, preventing them from getting absorbed by Qadim. 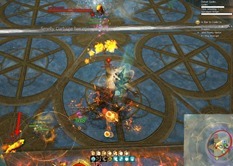 This role can be done by solo by a Thief with Signet of Malice and Invigorating Precision (heals them on attacks & crits), or it can be duo’d by a DPS class (power preferred) and a support class to keep them alive and hold Qadim’s agro by being closer to him than the DPS (remember aggro is proximity based). 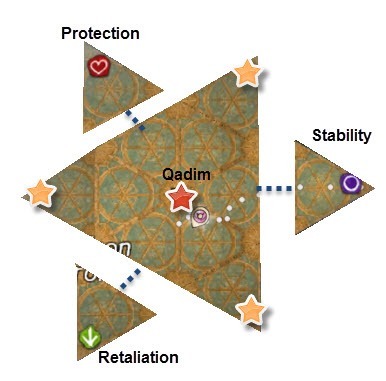 Qadim will use two attacks against you – the first he will wind up flame balls in his hand and throw them at your current position. These will only hit you if you are standing still, so continuously move and you do not need to worry about this attack. 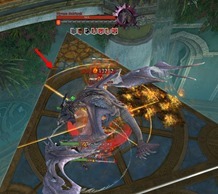 His second attack is lighting up the golden details on the triangle platform with moving fire. If you are hit by this attack it will apply burning and weakness on you, making it harder to both stay alive and to kill the Lava Elementals. After about 45 seconds he will start to destroy your current platform and tether to you. 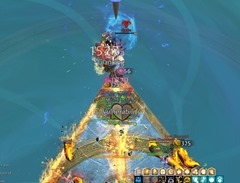 When the platform is destroyed/tether ends he will teleport to whatever platform you are standing on. Simply move to the closest one during this process and begin again. 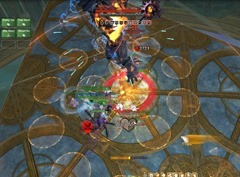 Lamp Team is composed of 2-3 power DPS, usually with a Power Chrono and an additional DPS such as Guardian. This team is required at start of 100%, 66% and 33% phase and they have a very specific job of summoning help for the Legendary Boss team upstairs. 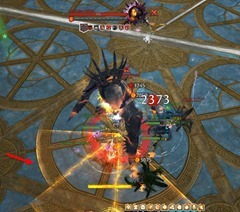 Some groups have an entire sub group going into the menagerie at the 33% for additional safety and to bring back out the allied monster quicker. 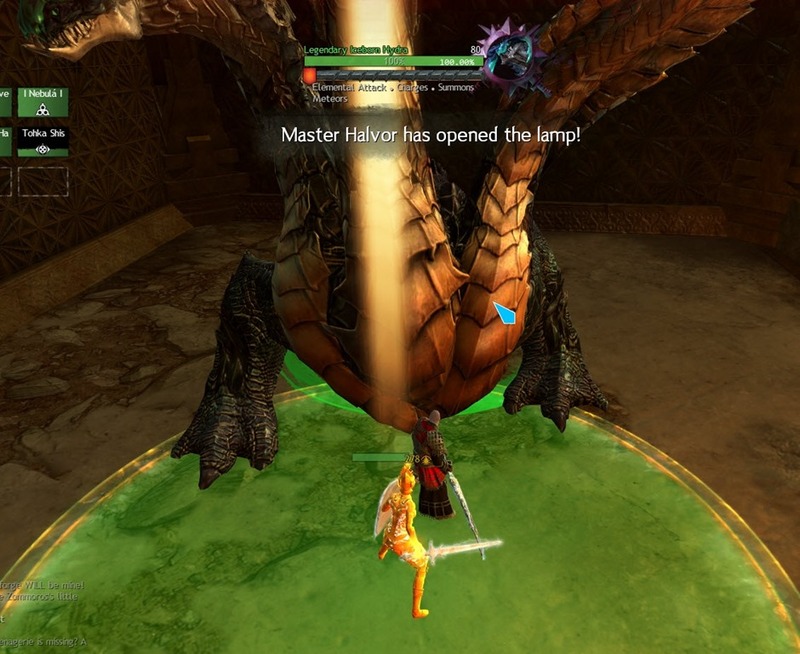 Teleporting into the lamp is done by a large green shrinking AoE in the center of the arena that occurs at start of the fight and then at start of the 66% and 33% phase. 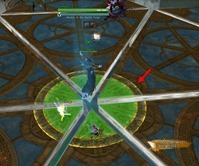 Once they are teleported a physical lamp with low HP will spawn in the middle of the arena. Players not part of the lamp team need to stay away from the center. Upon reaching the exit room you will encounter an allied mob. 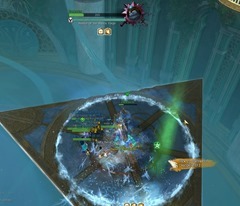 Call for your team to kill the lamp on the arena floor and then a green circle appears undernearth one of your lamp team players. Run to the allied monster with the green circle and have everyone in your lamp team stand inside it to get teleported back out. Join the rest of your team in their fight and your allied mob from the end of the menagerie will join you. Everyone not part of the Elemental Kiting or Lamp Team will be part of the Legendary Boss Team. 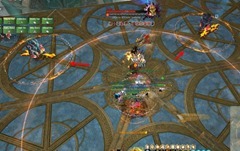 It is composed of a tank, healer and then rest of your DPS. 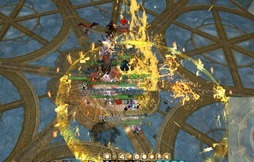 Ancient Invoked Hydra spawns at the 100% phase. 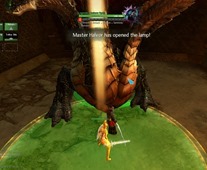 It spawns at the entrance of the fight arena. 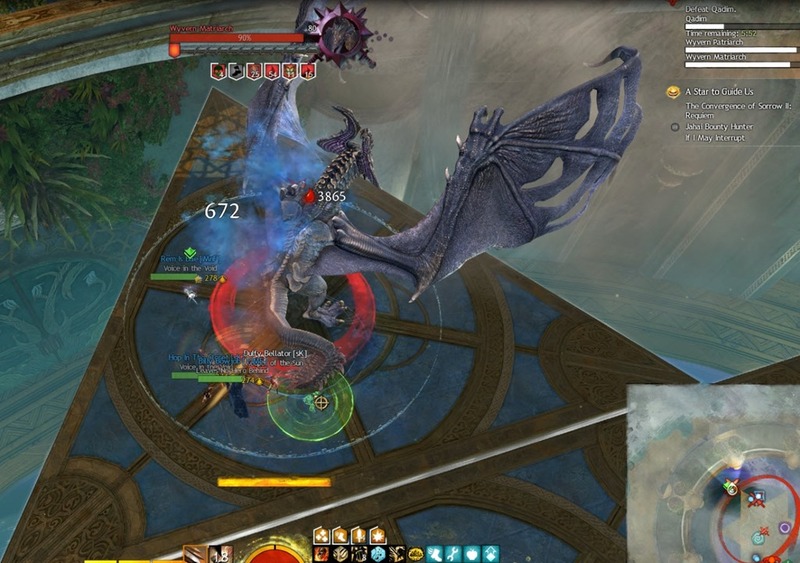 Aggro is proximity based and the Hydra has a very large hitbox so do not get too close unless you are the tank. 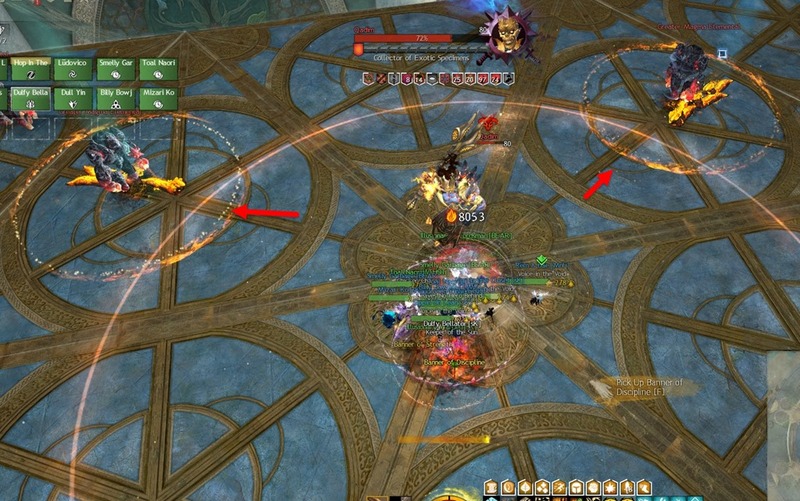 Pulling aggro and turning the Hydra on rest of your raid stacked to the side/behind of the Hydra can be deadly. 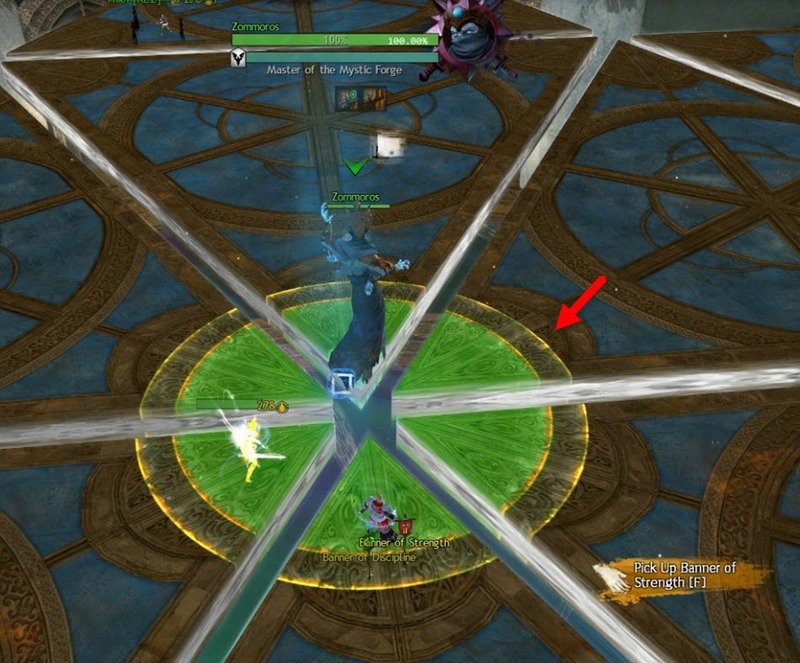 The Hydra has a very basic but hard hitting attack pattern that should be absorbed by your designated tank. 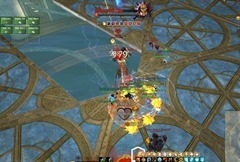 Chrono is the ideal tank here as it has lots of active damage mitigation skills. The attacks are as follows: Dual Bite -> Dual Bite –> Elemental Breath-> Dual Bite-> Dual Bite –> Fiery Meteor (with CC bar) –> Dual Bite –> Dual Bite –> Teleport –> Repeat. The Dual Bite attack will also apply poison, bleeding, and chilled if you are hit by it. 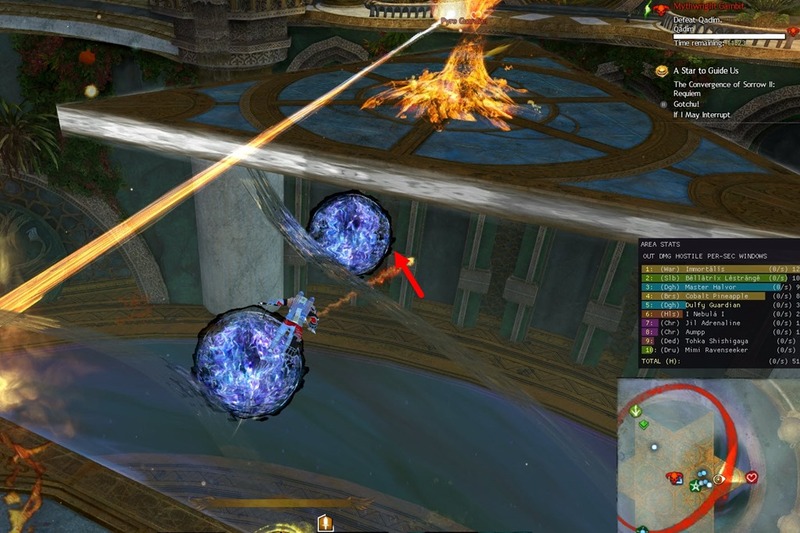 Elemental Breath is a laser beam like attack that knocks back enemies and applies conditions. Usually by the second time the Hydra does this attack, he will have a small AoE undernearth him that isn’t countered by block/invul. 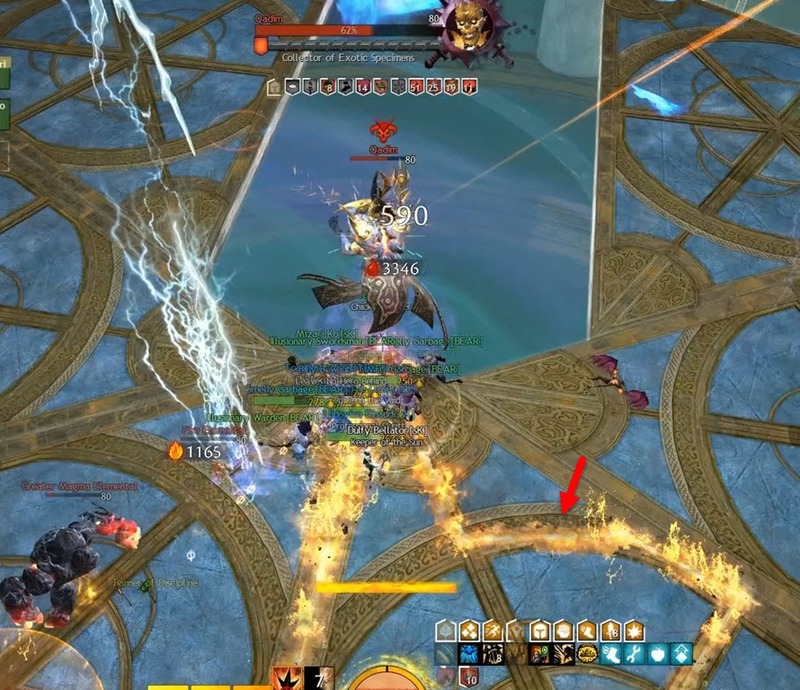 If you get hit by this AoE (can be sidestepped or dodged), you will be teleported to Qadim’s current platform, which means then you will need to run back to the Hydra, resulting a DPS loss. 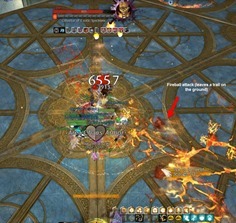 Your screen will have a yellow border if you step into the AoE so if you are quick you might be able to dodge out of it. 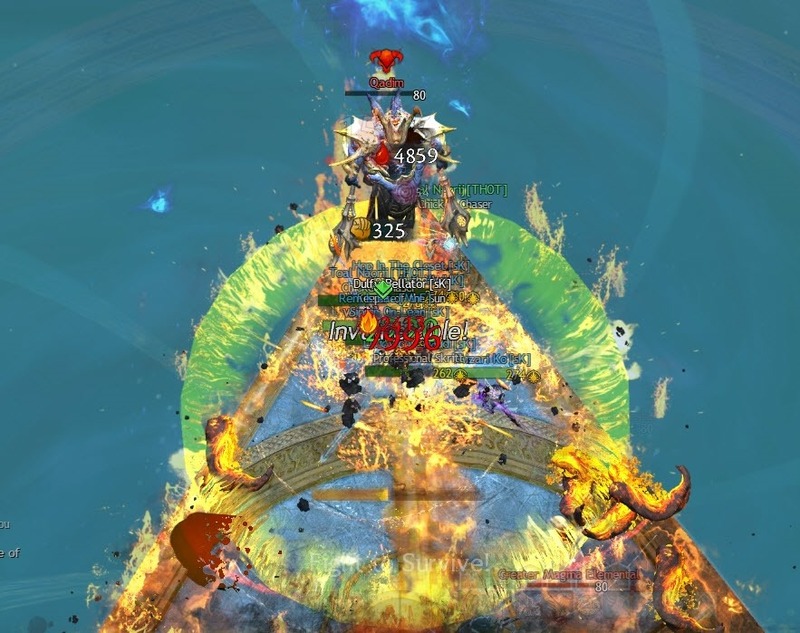 For the Fiery Meteor attack, the hydra will cast a meteor on every player on the arena (except for the Lamp Team) for every second you do not break its bar and this can very easily wipe players especially if they are stacked, so quick breaks like Tides of Time/Moa are vital. 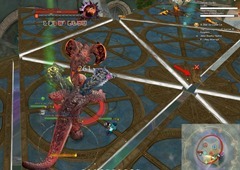 After successfully breaking the hydra will do two more double bites and then teleport to an adjacent platform, whichever it is facing at the time. Depending on the speed of your Lamp Team they should be ready to bring back the allied creature so have a designated player go and kill the lamp in the middle. If the lamp team was fast you will not have a second meteor CC bar but if they were slow you will need to break again. Once the lamp team returns with their allied creature, a Legendary Iceborn Hydra, it will steal the Hydra’s agro and use an Ice Beam that takes out 80% of the Hydra’s health and then stun him. After this stun if the Hydra is still alive he will repeat his attack pattern until he is dead. The Apocalypse Bringer is a destroyer legendary boss that spawns at the 66% phase. Much like the hydra, he has proximity aggro. 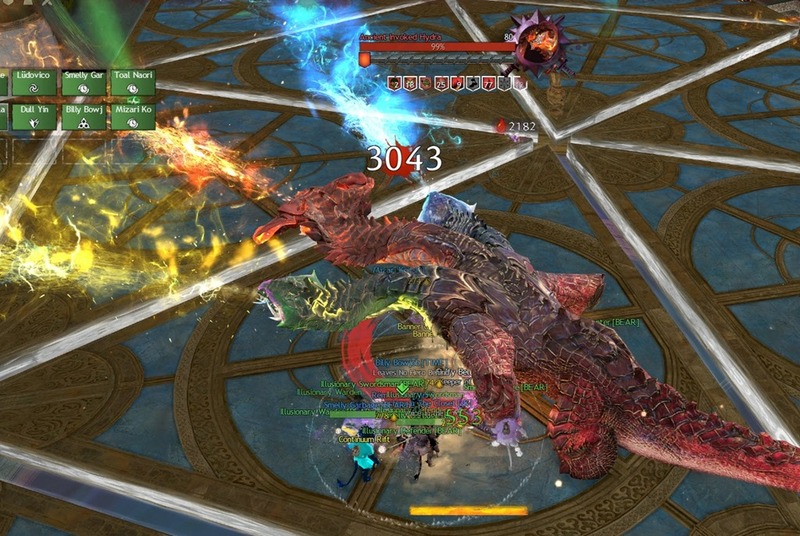 The Destroyer will immediately start with a breakbar, which if not broken quickly enough will spawn sets of Destroyer adds on your party and the kiter, making their job difficult. 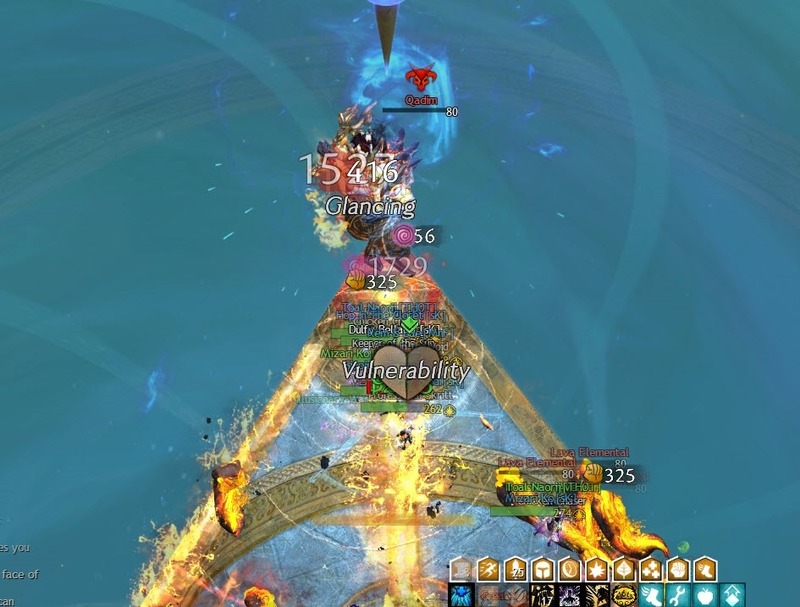 So be prepared with your CC and use it immediately as soon as the Destroyer boss spawns.Three Champion Reapers of Flesh will also always spawn around the Destroyer’s platform and move their way in. If you CC them they are very quickly cleaved down while attacking the Destroyer, but if you don’t they can really hurt your party. 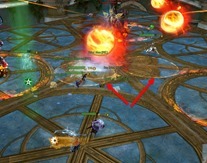 The Destroyer has three main attacks: Wave of Force (swipe), Seismic Stomp and Shattered Earth. All three attacks are well telegraphed and can be dodged easily.His attack pattern is: CC -> Wave of Force -> Wave of Force-> Seismic Stomp-> Wave of Force -> Wave of Force -> Shattered Earth –> CC. Wave of Force is simply a telegraphed 3 slice conal swipe that will knock players back if not avoided. Seismic Stomp and Shattered Earth are fairly similar attacks. Both are circular AoEs originating from the boss. In Seismic Stomp he will simply pound the ground with a wave attack. 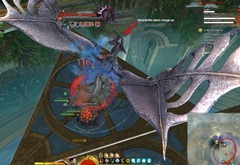 With Shattered Earth he will jump up in the air, drop small AoE circles and then jump down to send out a wave attack. 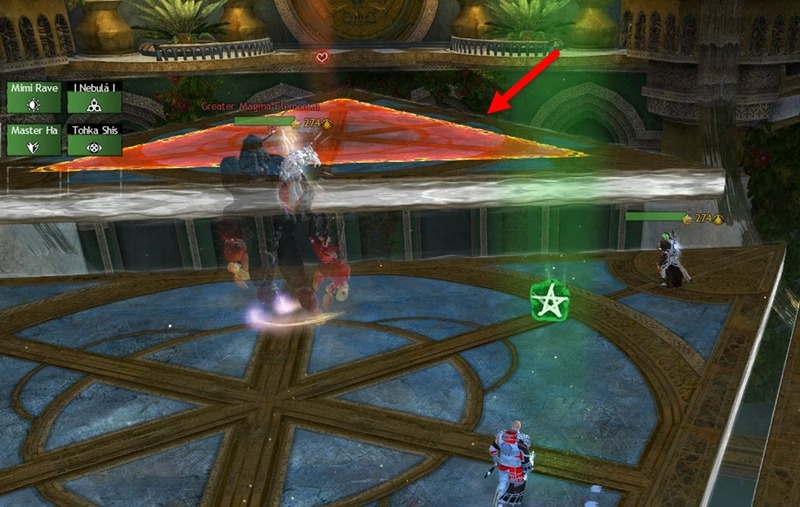 During the second CC the same teleport AoE will spawn in his hitbox that will again teleport any players in it to Qadim on the other side of the arena if they do not dodge out of it. Around this time your lamp team should be done, so one of your DPS should kill the lamp allowing the lamp team to return to the arena with their friendly Legendary Ice Elemental. 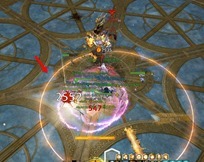 The Ice Elemental will again knock out 80% of the HP of the Destroyer and stun him. Continue damaging the Destroyer until he is dead. Matriarch and Patriarch Wyverns spawns at the start of the 33% phase but at the north most set of 4 triangle platforms. Note a newer configuration of the platforms and the locations of Qadim and Lamp. They have half the HP of previous bosses. 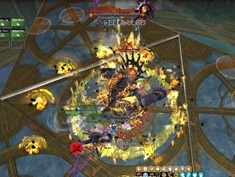 Your team should focus on one boss (most groups do the Patriarch first) while have someone else split from the group and tank the other. 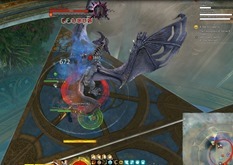 Both Wyverns (especially the Matriarch) must be tanked in melee range or they will shoot fireballs at rest of the raid. Aggro is again proximity based. Both Wyverns have similar attacks: Tail Swipe, Slash, and Fire Breath. Tail Swipe is simply a side tail sweep that can be easily side stepped and has a clear telegraph. Slash is a combo of two attacks where the wyvern sweep with one arm and then follow up with a pound with the other arm. 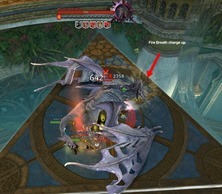 The sweep can be dodged/side steeped and you can avoid the pound by running into the wyvern’s hitbox. There is no telegraph for this combo attack. Fire Breath is a simply a frontal AoE attack where the wyverns splits fire in front of them that can be easily sidestepped. What the Matriarch and Patriarch differs is their “special” attack. 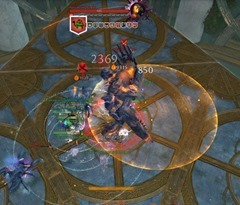 Matriarch has a Wing Buffet attack where she will raise up both arms and then start blowing wind, knocking back any player in front her, possibility off their platforms. 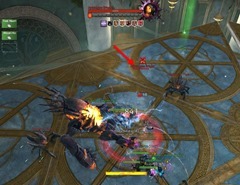 This attack can be avoided by running through the Matriarch during the charge up animation. If your Matriarch kiter does not keep her agro facing away from your Patriarch team, they will have a hard time staying on the platform to keep DPSing the boss. Patriarch, however, has a breakbar attack. You must break his breakbar or he will destroy his current platform, forcing you to float to the next. Patriarch/Matriarch attack cycle goes: Tail Swipe-> Slash –> Fire Breath ->Tail Swipe-> Slash -> Slash –> CC/Wing Buffet. After this cycle they will move to another platform and continue their cycle. After the wyverns moves to a new platform, your Lamp Team down below should be near finishing so the designated lamp breaker needs to break them out. Zommoros dual wielding Eternity Greatswords will be your ally for this round. 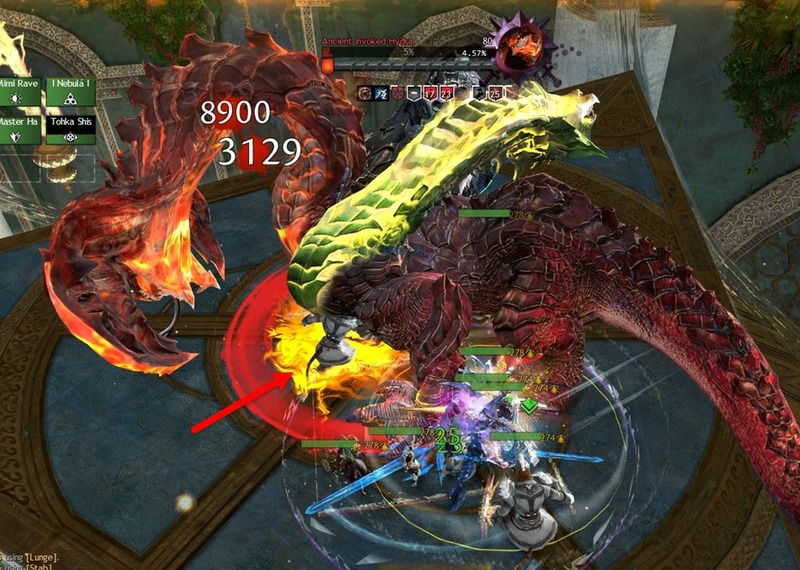 He will deal approximately 75% of the Patriarch’s HP as damage to each Wyvern and stun them. 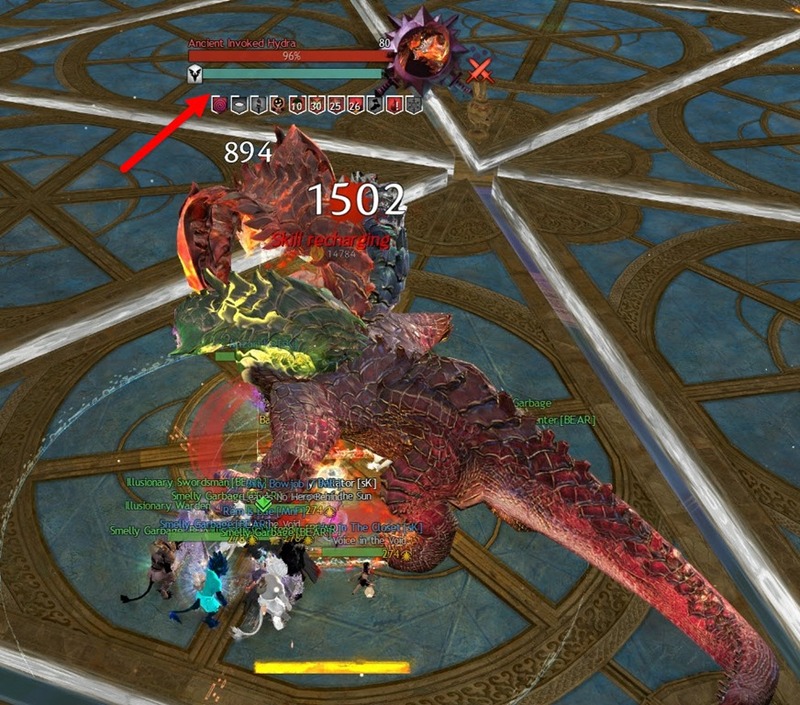 After this continue killing the current wyvern and move to the other wyvern when one is dead. 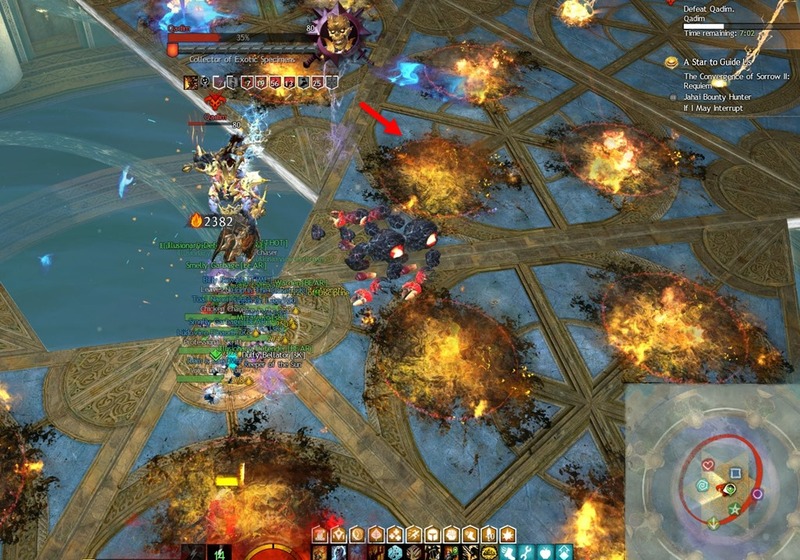 Zommoros will also then move to Qadim and essentially replaces your Elemental Kiter team, so they can come join the group and DPS the wyverns. 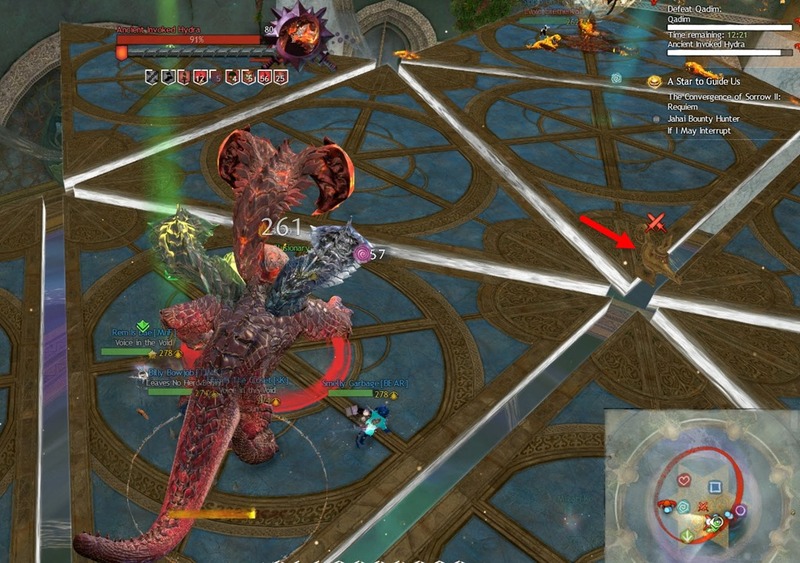 Once both wyverns are dead your raid team should run back across all of the platforms to Zommoros. 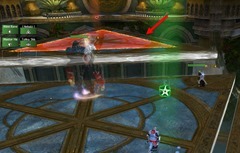 The platforms that make up the fight arena have gaps between them and will move throughout the fight. If you fall off of the platform you will take ticking damage and be pushed back up as if you are flying. The longer you spend in the “limbo” flying state the more damage you will take, so make your way back to a platform ASAP. Beware that sometimes the platforms can move and close the gap you fell off from so you may not able to get back up. 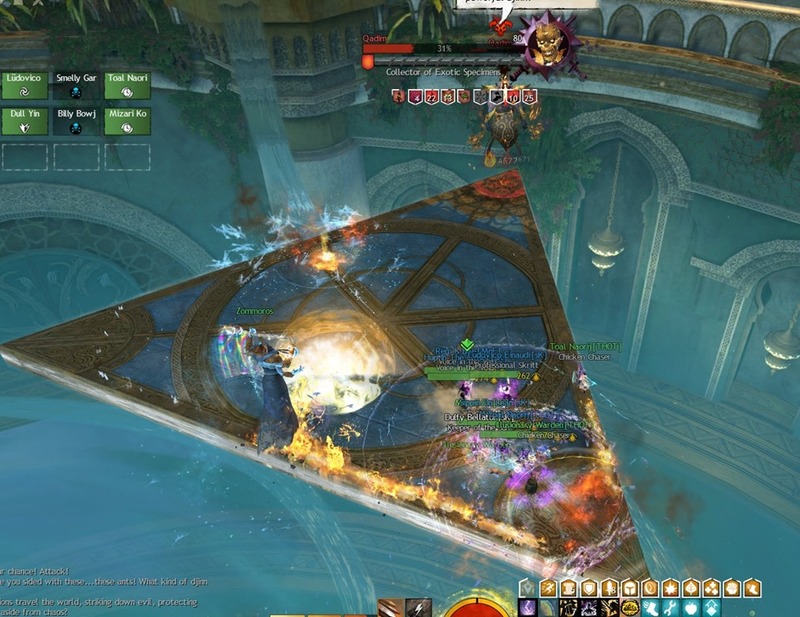 In Challenge mote falling off the platforms is an instant death. 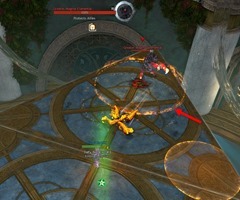 Platforms will also disappear and reappear throughout the fight as part of the mechanic for certain phases. Right before a platform disappears it will have a glowing red triangle that expands until it reaches the edges before destroying itself. All aggro in this fight is proximity based. So this means that whoever is closest to Qadim and any of the Legendary bosses will have aggro. 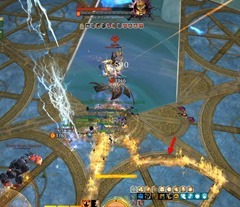 This means that the tank should stand bascially inside of the enemy’s hitbox and face the enemy’s attacks away from the group. This applies to the Hydra, Destroyer, Wyverns, and Qadim (although don’t stand in Qadim’s hitbox as he has a Toxic Trail like damaging effect). All of the Legendary bosses have very large hitboxes so DPS do not need to stand too close to damage them. Throughout the fight Qadim will spawn circular fire AoEs that are near the corners of each triangular platform. This means that safe DPSing during middle phases should be done from the near the sides of each triangle platform, not the corner. 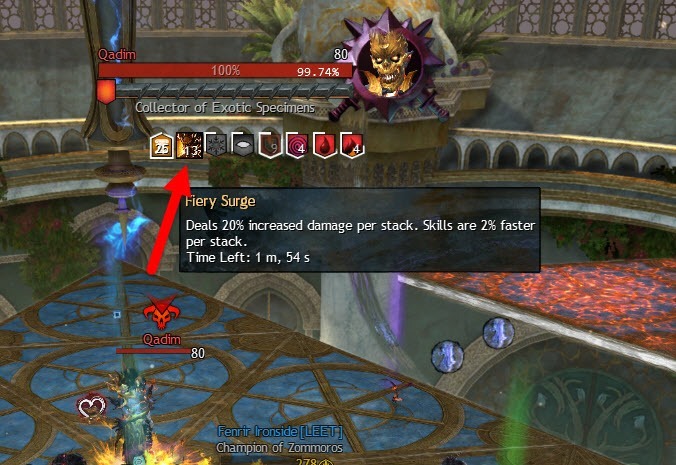 The 100% to 66% burn phase occurs right after the Ancient Invoked Hydra Legendary boss dies. Qadim will teleport to the middle of the fight area but you won’t get to damage him right away. 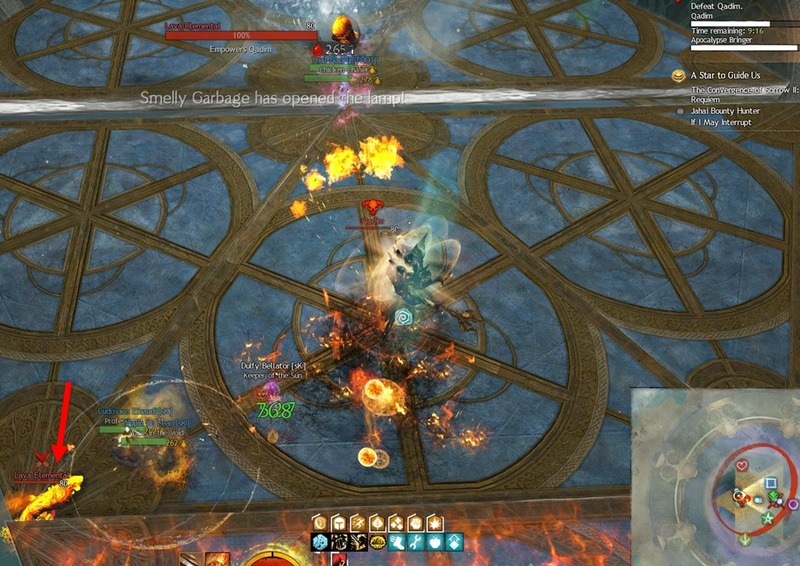 Instead, you will need to deal with the Magma/Lava Elementals and the Guardian Pyres. 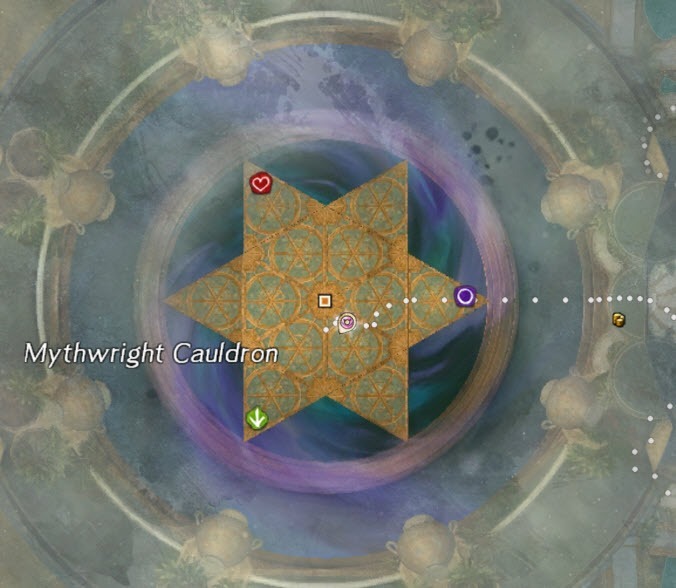 Guardian Pyres spawn at the three “corners” of the map on platforms now disconnected from rest of the fight arena that can be accessed via jumping through the purple transporter balls. .They will give Qadim 25 stacks of Stability, Protection and Retaliation until they are killed. 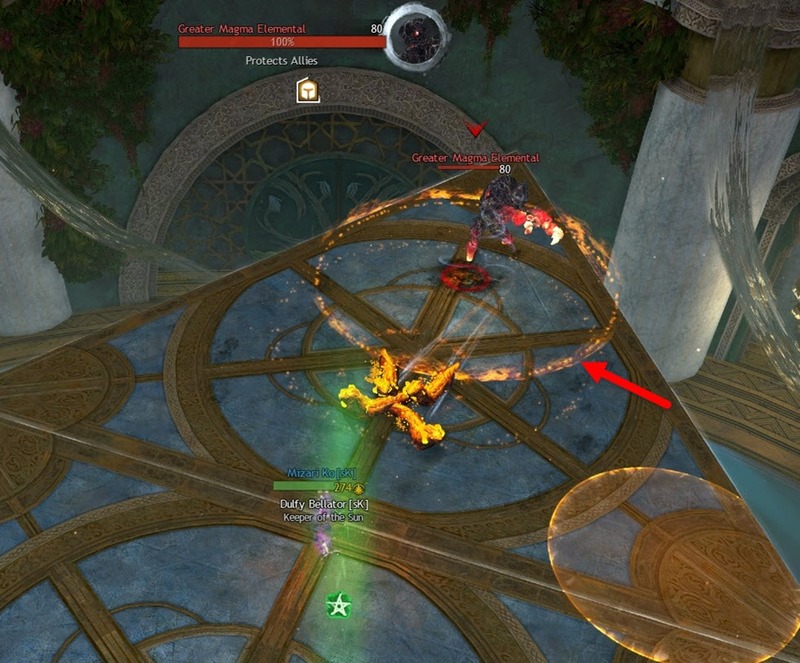 Additionally, they will throw bouncing fireballs at the fight arena, hitting anyone caught inside for 90k+ damage, instantly downing them (but can be blocked/invul/evaded). 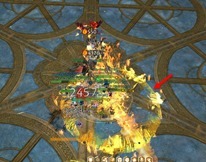 You will need DPS assigned to each pyre to take them down quickly. For the Protection and Retaliation pyres you also need boon strips as these Pyres comes with Protection and Retaliation that needs to be removed first (stability on the pyre can be ignored). Those not on Pyre duty will need to deal with the Greater Magma Elementals and Lava Elementals that spawn on platforms marked with yellow star on the map above. 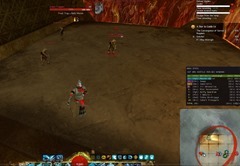 Greater Magma Elementals will spawn with 4 Lava Elementals, and walk towards Qadim. These Magma Elementals will spawn with a shield preventing all CCs and damage to the Lava Elementals. 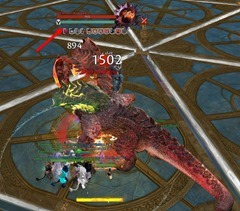 Your team must CC the Greater Magma Elementals and their shield away from the Lava Elementals such that they are vulnerable and can be cleaved. A chronomancer focus pull or holosmith Big Ol’ Bomb work great here, but so do stuns/immobilizes as they will only stop the Greater Magma’s movement allowing the Lava Elementals to slide out of the shield. If your team lets any of these Lava Elementals near Qadim he will gain Fiery Surge stacks for 2 minutes, making him deal more damage during the burn phase and for the next kiting phase. 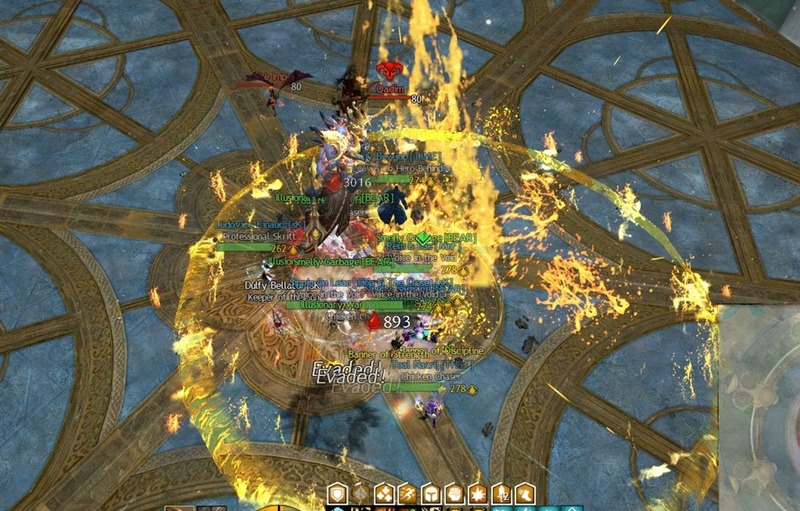 Once all the Pyres and Elementals are dealt with you can now stack in the middle and burn Qadim to 66%. He will again select the nearest target and focus the majority of his attacks on them as the “tank”. 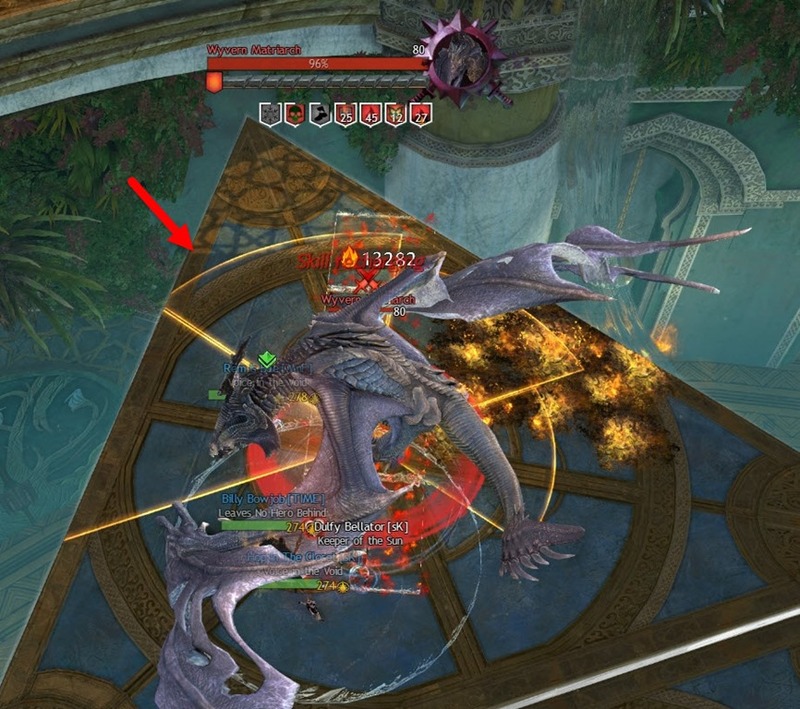 As stated before, he will have a Toxic Trail like AoE inside of his hitbox so if you wish to have a designated tank for the burn phase you cannot maintain being inside his hitbox. Much like the Elemental Kite mechanic from before, Qadim will throw fire orbs in a line towards the tank. This can be out healed. He will do this with his right hand, left hand, and both hands (larger cone). 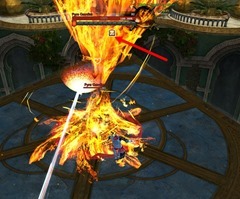 The attack that is far deadlier is a new shockwave attack called Flame Wave. He will light up the gold lining on the arena floor with fire out in all directions and then you will see a thin gold ring radiates from him. 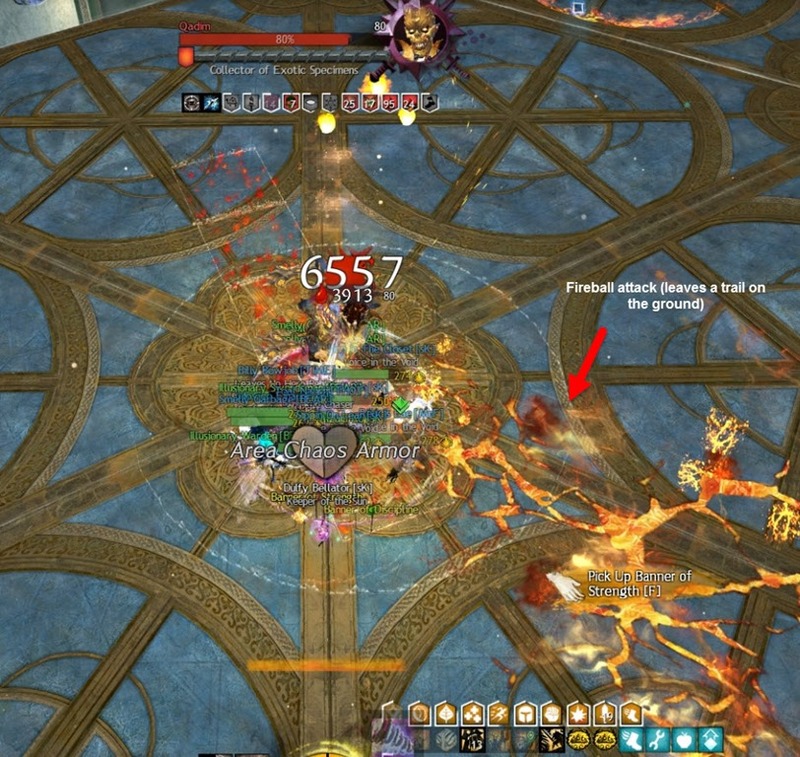 Immediately following this he will send out another fire line in one direction and proceed to slam in that direction, causing massive damage and knockdown to anyone that didn’t block/evade/invul/dodge it. The 66-33% phase plays out similar to the 100-66% phase except for less platforms and all the Pyre Guardians will move by one platform counter clockwise. 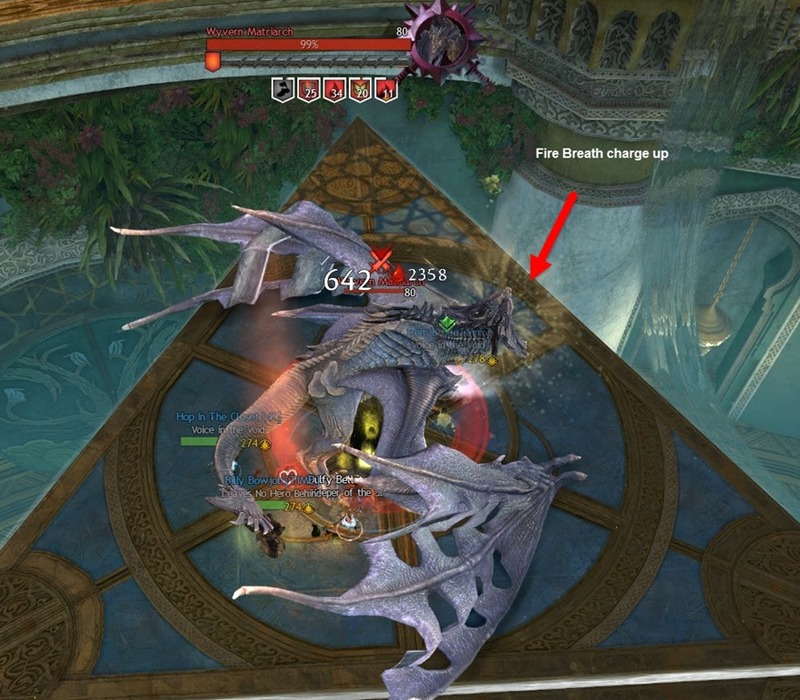 So if you had squad markers for the pyres from the previous round, just go counterclockwise from them for the new Pyres. You may have to deal with the second round of Magma Elementals/Lava Elementals. 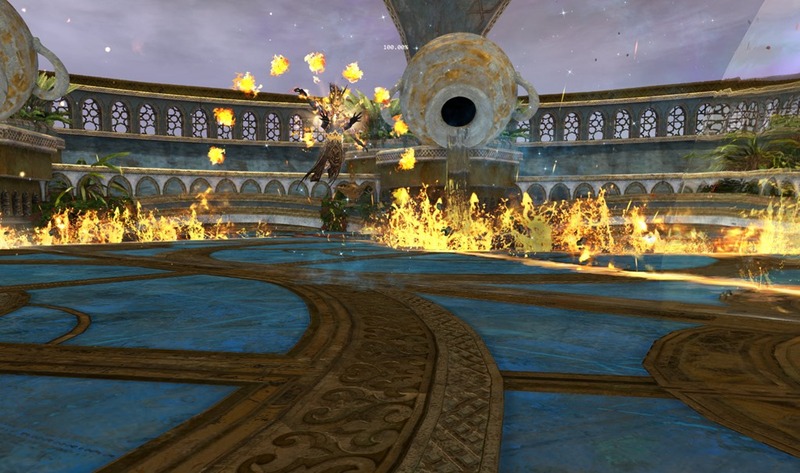 During the burn of Qadim you will notice a large gap behind Qadim where the platforms are no longer there. The final 33% of the fight plays much differently. Run back to Zommoros after you have killed both Wyverns to start this final phase. Zommoros’ platform will move your raid team to the entrance and then you start with a brand new platform configuraiton to get to Qadim. Several of the platforms will now rotate and you will need to wait for the plafforms to line up to make it across. 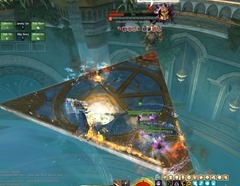 Platforms will also disappear as soon as your raid cross it. 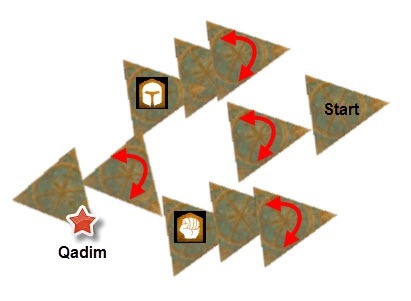 Before you can damage Qadim, you need to boonstrip and take out the Protection and Retaliation Guardian Pyres along the way. While you are doing that, you still need to pay attention and avoid the fire AoE attacks from Qadim and one shot bouncing flame balls from the pyres. 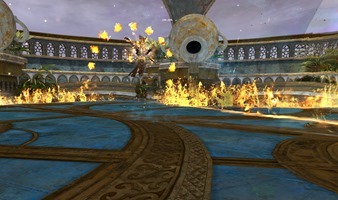 Qadim will again do his standard flame throwing attacks awhich essentially must be outhealed as the arena space is limited. There is also the CC breakbar mechanic as well. He will jump around to the different corners of this platform until he reaches about 15%. 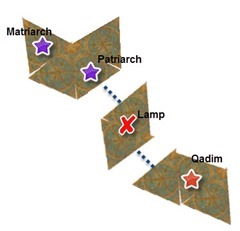 At 15%, Qadim will teleport to a secondary platform and you must follow him. Here he will remain stationary in one corner of the triangle platform and spawn 2 Greater Magma Elementals each with 4 Lava Elementals. These again can be handled with knockbacks/CCs or even a single properly placed focus pull. Make sure you cleave down the Lava Elementals before they get to Qadim. 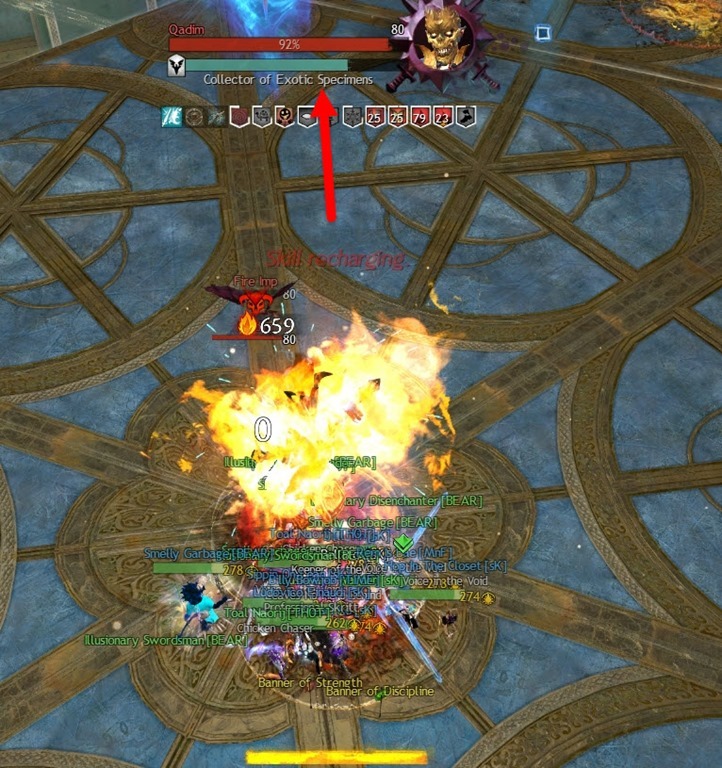 The biggest raid wiper mechanic here is Qadim’s upgraded Flame Wave attack. Unlike previous iteration of this skill, there is no longer a golden ring telegraph prior. The only warning you have at this phase is watching the animation and keep an eye out for a single fire line that precedes the shockwave attack (hard to see with all the lava elementals and fire effects around). 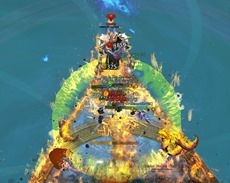 Be ready with spirit rez/war banners/rebound to resurrect downed raid members in the final burn. Special thanks to sK for the raid carry and Rubik for writing the initial draft. 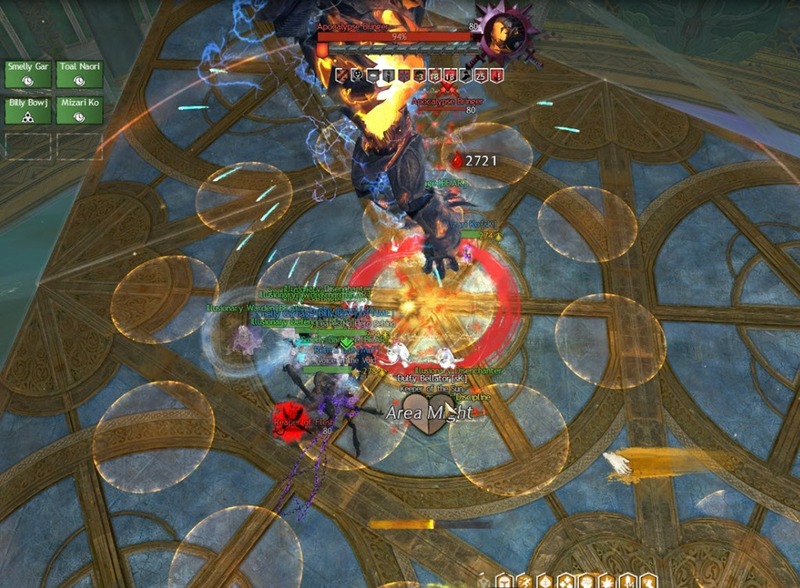 Players interested in getting started in raiding may check out the GW2 Raid Academy Discord [US] (not affiliated). The Elemental Kite video is no longer available? 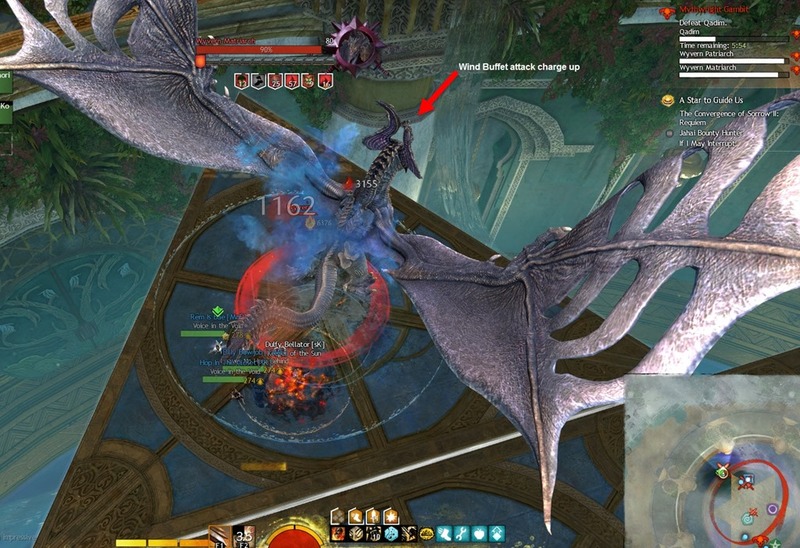 Is insta death at falling the only CM mechanic? Nothing more? The lamp team video is unavailable.